I’m giving away licenses to commercial software products today! That’s right! Well… sort of. Ok, not really. I am going to tell you where you can go to find them though. This is a review of a website that does just that. They find good commercial software products that you would normally have to pay for and they arrange to give them away for FREE on their site for one day. You can go back to the site every single day and get a new software product… pretty cool eh? Want to find out more? When you first land on the site you are immediately greeted with the sites credo to let you know what it’s all about. You’ll also notice that you can access the site in a number of different languages like (Spanish, Italian, German, French and Portuguese). There is of course a search function at the top of the site that allows you to search for software. This is after all a good catalog of applications. Ok, now for the meat and potatoes. In the center of the screen you’ll find the star of the show, the center attraction, the giveaway of the day! 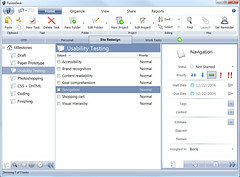 There is a mini-screenshot of the application along with a summary and a few pertinent details such as a user rating, system requirements, links to the publisher’s homepage and the product’s homepage, the file size and the regular cost of the software. You can click on the More button to jump to a product specific page and read in greater detail about this software and it’s features. You’ll also be able to download it from here. In the Download section it usually tells you to make sure to look in the readme.txt file for instructions. Be sure you do as there are specific instructions that they have arranged with the software publishers on registering the software on your system. That’s it! Download, unzip, read the readme.txt, install. Done. So, Jonathan, what kind of crappy utilities am I going to pickup on this freebie site? Nay, nay my friend. This is not your everyday freebie fodder; this is high quality commercial software. In fact while writing this very review I revisited the site to go over the features again and refresh a few things in my mind. The latest software was something that I’ve actually been searching for for some time now. The program is called FusionDesk Deluxe. At the time you read this it’ll no longer be free but $59.95. It is project management and time tracking software for individuals and small teams. It has a very simple interface, has multiple projects with multiple tasks assigned to each and has work timers 🙂 . One of the other cool software packages that I’ve picked up is the Glary Utilities, normally $39.95. This is just a great set of system tools and utilities for maintenance, hacking, fixing… what-have-you. Don’t want to keep going back to the site manually everyday? I don’t either! You don’t have to because they have an RSS feed. Yay! Just subscribe to the feed and you get updates everyday and you won’t miss out on your opportunity to get a great piece of commercial software for FREE. What!? There are cons? Well, just two… kind of. Disk space. You are going to find so many cool software programs that you will soon fill up your hard drive. Go ahead and upgrade now… you’ll need the space! What are you waiting for? Get over there and get yourself some free applications. Did I mention they’re free?